There was rain and wind and troubled sleep. There were tired eyes and weary limbs. But it was worth it. For the thrill of a new and strange experience. An experience unique in all the world. You may not have heard of it if you live outside Britain. It’s one of those counties that veils itself in an aura. ‘Nothing worth seeing’ it whispers. The call of its lush landscapes and secret treasures drowned out by lorries on teeming roads bearing heavy industrial wares. Treasures like ancient reindeer antlers. The six pairs of antlers that usually hang in St Nicholas’ Church, in the village of Abbots Bromley, on the edge of the Forest of Needford. Once a year they’re taken down and carried around the local area in an exhausting, 12 hour romp called the Horn Dance. It wends around modern housing developments and visits old farms. Tramps along ancient, tree-lined routes to a grand old house. Stops at the many pubs the area boasts. But what, you might ask, is the provenance of the title’s quotation? 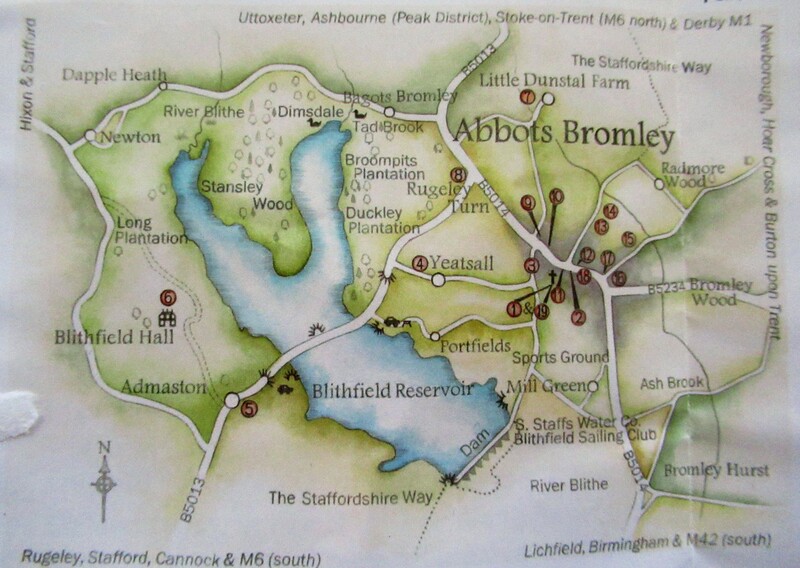 Well, Staffordshire adjoins Warwickshire. And Warwickshire’s most famous son is the bard himself, Will Shakespeare. “What shall he have that killed the deer? Then sing him home; the rest shall bear this burden. 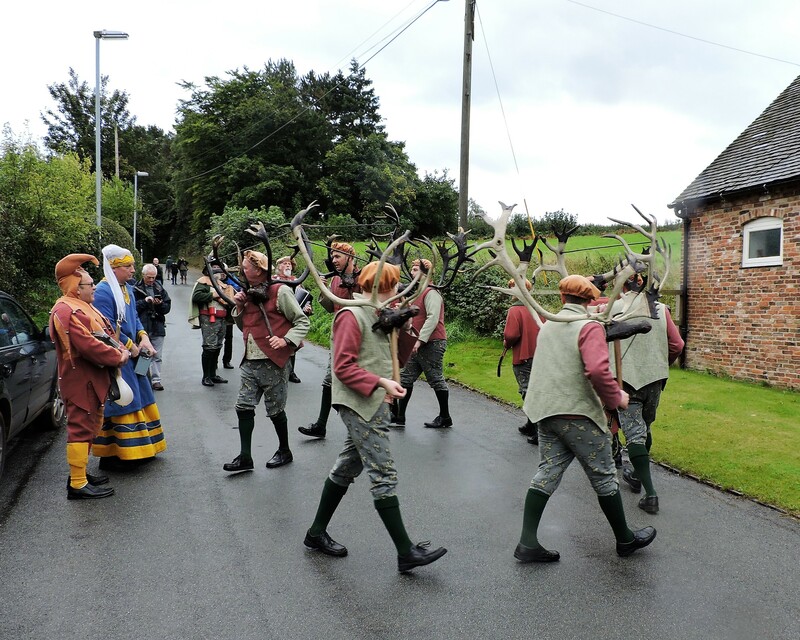 A key figure in Abbots Bromley’s Horn Dance is a ‘hobby-horse’. Not the head-on-a -stick kind that children of yore rode in the nursery, but a mock steed with a clacking jaw and frisking tail. 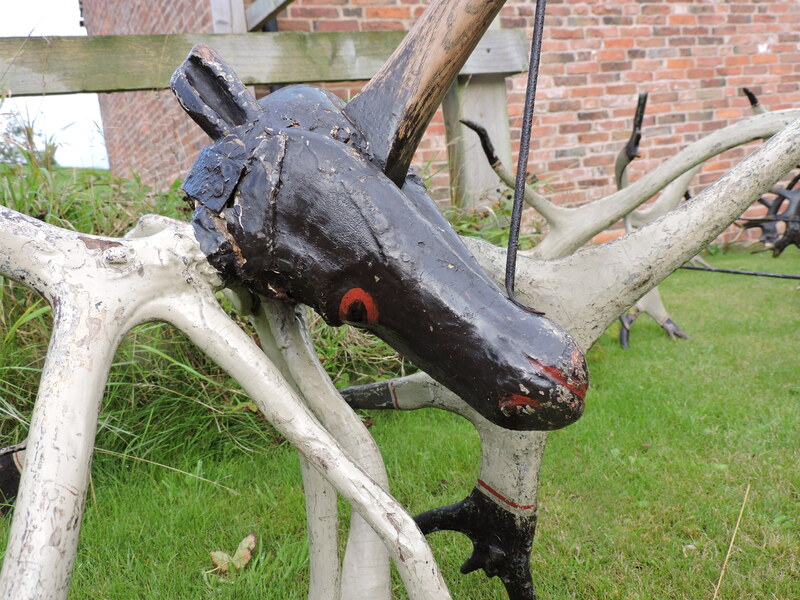 There are hobby-horse and skin-wearing traditions in various parts of Britain, but this is the only one in the whole nation, nay (groan) the whole world, that combines hobby-horse with reindeer antlers. Anyway. The bardic connection, then, could be based on personal knowledge. But a more intriguing mystery lingers around the antlers. We know the dance is probably at least 500 years old. The earliest recorded mention is from 1532 and it was described fully, in the Natural History of Staffordshire written by naturalist and antiquary Robert Plot, in 1686. In the 1970s, radio-carbon dating of one of the antlers produced a date of 1065 (plus or minus 80 years). So we know they date from the eleventh century and they’ve been in use since at least the sixteenth century. But enigma still shrouds the horns’ origins. There were no wild reindeer in the British Isles by the eleventh century. And while ‘scientific tests’ have reputedly revealed that the horns came from domesticated – castrated – herds, there were no domesticated herds at the time. Which suggests that the horns came from elsewhere, probably Scandinavia. But who knows when, or why, or for what purpose? Well, much as I love a mystery, it’s time to bring on the dancing. It’s not an event for lie-abeds. Like me. We had 10 miles to travel and decided to miss the church service at seven. But even so. Jet-lagged, I slept badly knowing we had to be up and out by 7.30 am. Somehow, despite the ample breakfast and fascinations of our b&b we arrived in the nick of time. 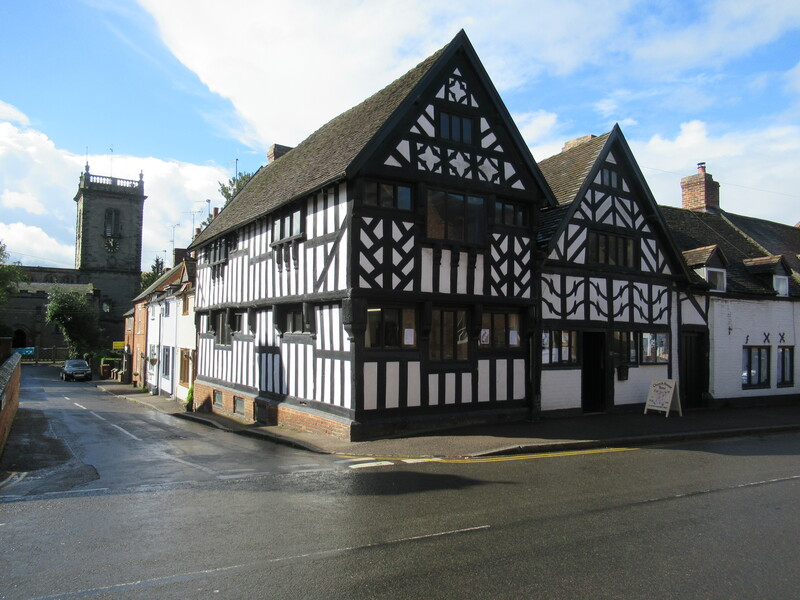 Parked our horseless-carriage by the white and black-timbered Goat’s Head pub. Emerged to the strains of music and laughter. And there they came, from the church. The hobby-horse, Harley-the bow-carrier (the only one whose name I asked) and six men carrying antlers. Three sets painted black, three white. 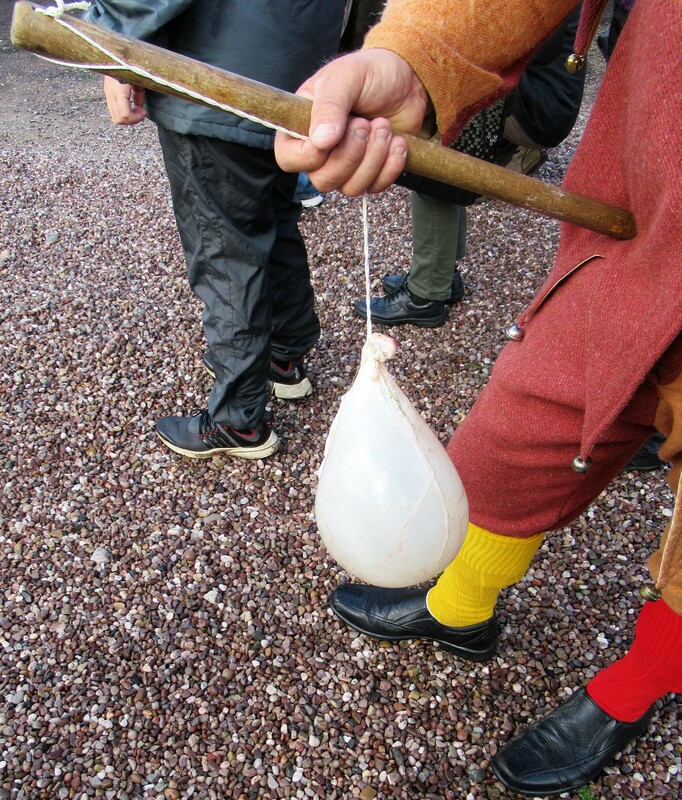 The troupe included wandering musicians, a jester with pig’s bladder on a stick and Maid Marian – a man in drag. Men and one woman with collecting tins accompanied the dancers, hoping for more than pennies, I’d guess. But pennies were traditionally solicited, for the poor of the parish. One reason why it was originally held in winter, when resources were scarce, around Christmas time. The current dance date is set to a somewhat complicated formula: the first Monday after the first Sunday after the 4th of September. It used to be St Bartholomew’s feastday, before all the confusing religious shenanigans and calendar changes of this country’s past. It’s a community-rooted event and despite the age of the tradition the troupe visited new housing developments as well as old venues. After several dances (and cloudbursts) around the village, the performers had a chance to ‘down horns’ for a welcome break with hot drinks. 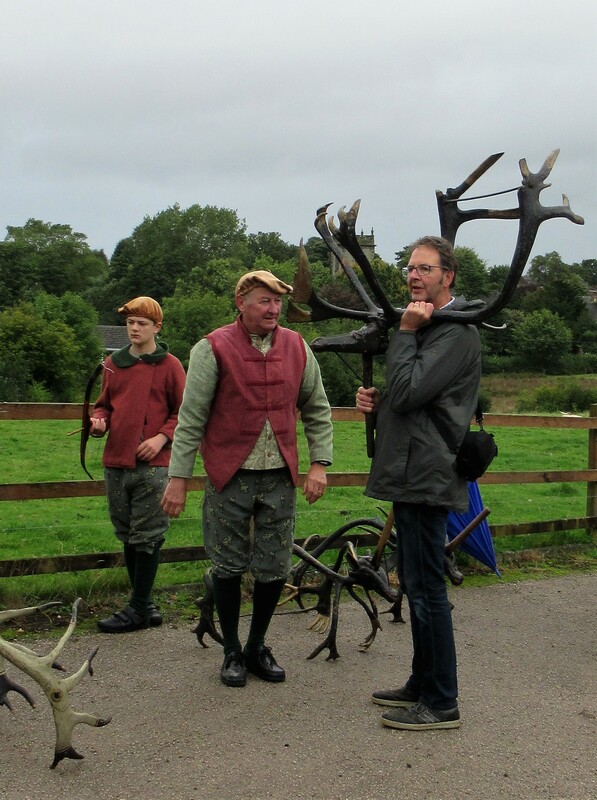 And we had our chance to pick up the antlers- which are heavy! The heaviest weighs over 24 pounds – quite something to carry. One member of the troupe has been dancing with the horns for over 50 years – I was awed by his stamina. Police community support officers accompanied us as we tromped uphill, out of the village towards the first rural stop at a farm. As the skies opened (again) we had another enforced rest, sheltering beneath large trees. 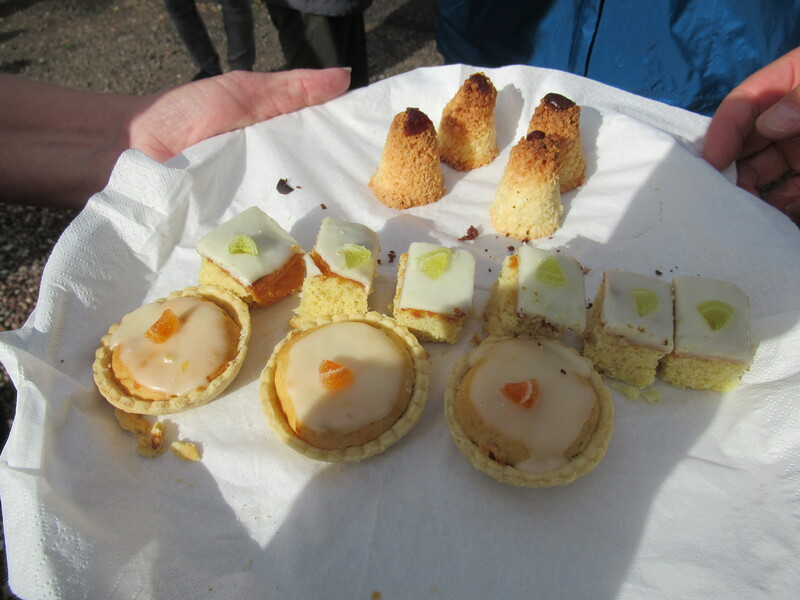 On reaching the farm, we were surprised – and delighted – to be offered beer, mulled wine and cakes. Also an old tradition – very welcome after 2 hours’ walking. And there, I’m afraid, we chickened out. A fruitless diversion back to the village for cash (to buy a t-shirt) meant we’d already walked twice the distance everyone else had covered. We were cold, wet and tired. If exhilarated. So as the dancers (in vans) and followers (on foot) set out for the stop beyond the reservoir – arguably the most spectacular venue (a stately home, but with plebs’ viewing confined to the ha-ha) – we left. 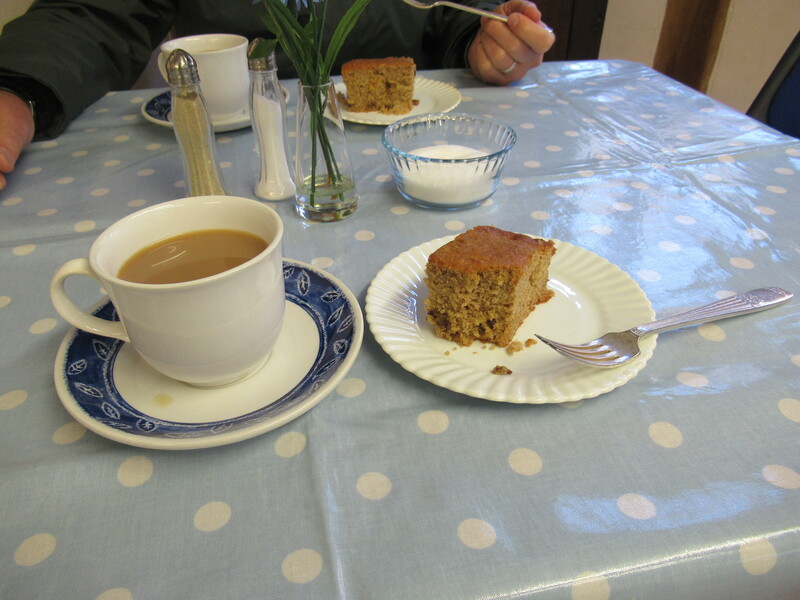 Back in the village, scrounging together our last £4, we fortified ourselves with tea (£1 a cup) and courgette cake (£1 a slab). 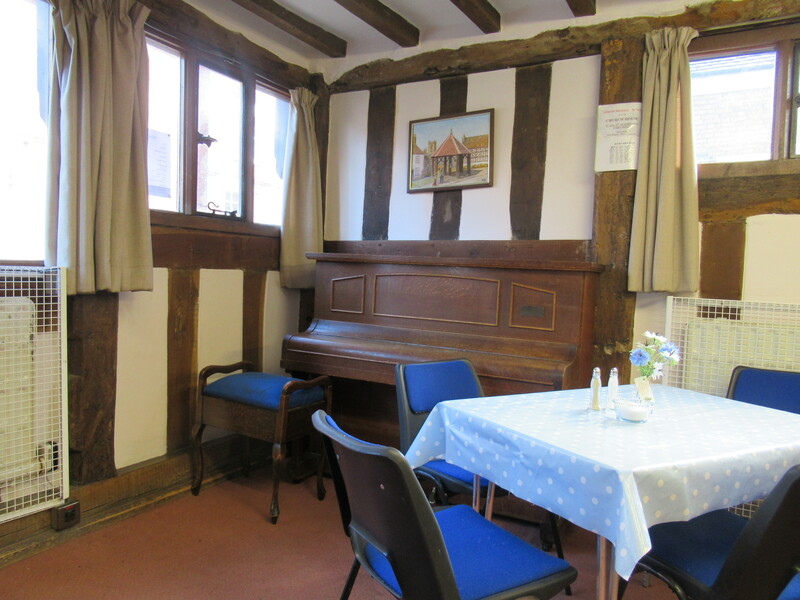 All made and served by volunteers in Church House, a fine timbered building with the date 1619 in its door lintel. And I felt a little emotional. We’d just experienced history. But also history in the making. The families that carry on the tradition. The folks who, like the ones at Hall’s Farm Yeatsall, serve strangers cake and ale. The musicians who play through wind and rain. 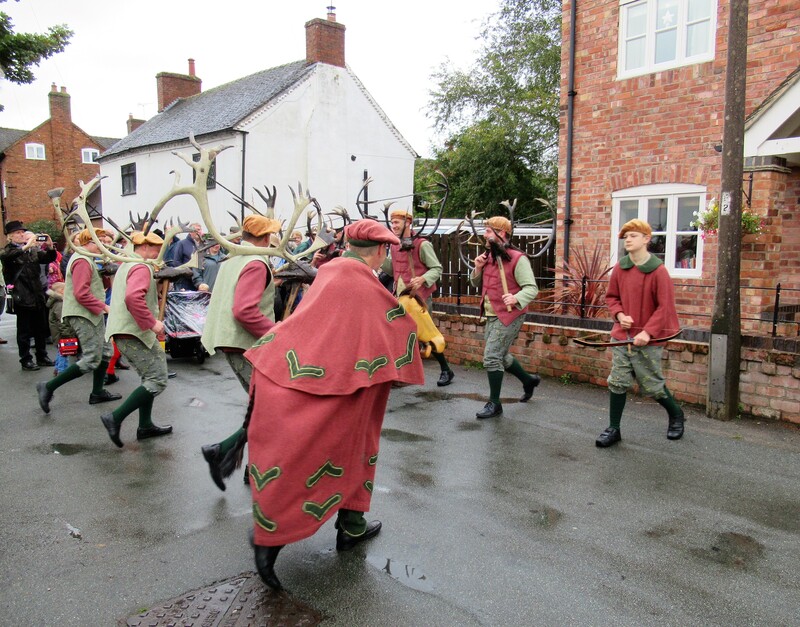 The men who don strange clothes and dance for miles and miles, carrying heavy antlers. The gentlefolk who served us tea and made us cake. I almost felt proud to be English. No, be honest. I did. 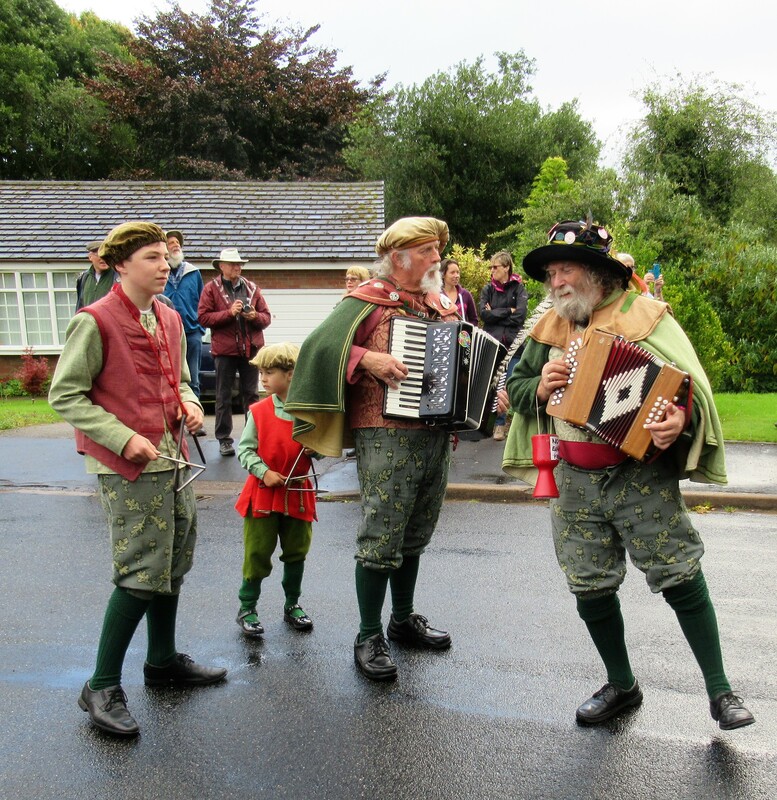 This entry was posted in Art, jaunts & going out, Britain now & then and tagged Abbots Bromley, dog singing, English tradition, hobby horse, Horn Dance, reindeer antlers, Shakespeare, St Nicholas Church, Staffordshire, tea and cake. Bookmark the permalink. 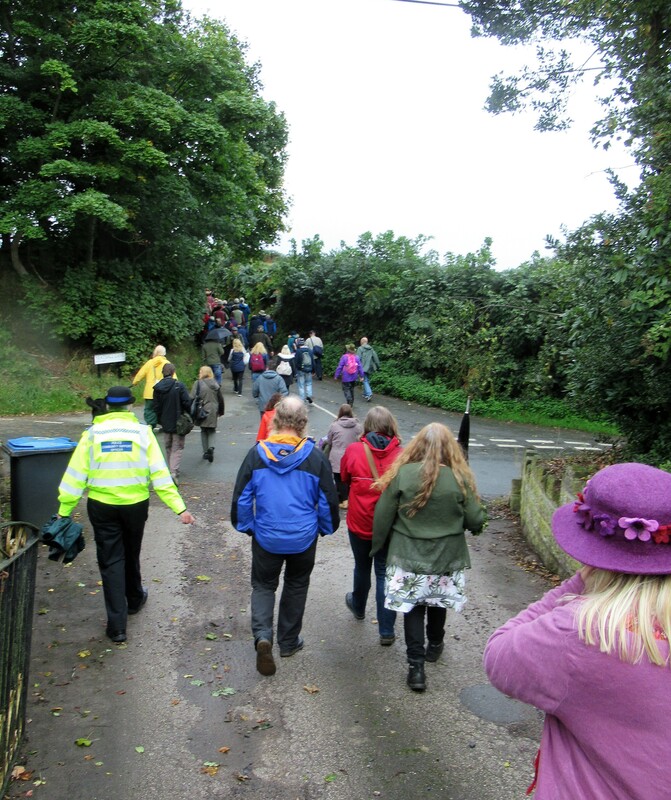 That was so enjoyable….not just keeping up tradition but making it inclusive by expanding the route to visit the hew housing estates. Oh yes…the dog. He had mine joining in and hunting for him under the table. All very English, wasn’t it. 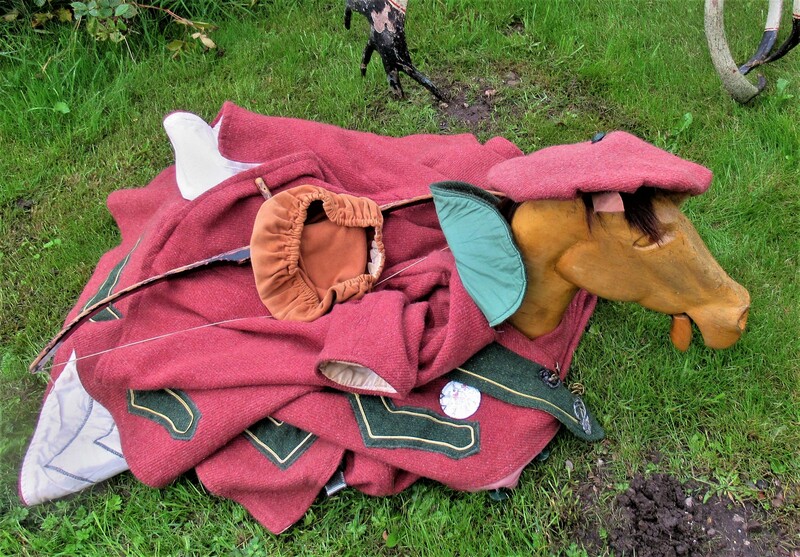 I can’t somehow see a Frenchman in a hobby horse…. This post was delightful, Mary! What a wonderful tradition … so much fun! Thank you for sharing! ‘One member of the troupe has been dancing with the horns for over 50 years – I was awed by his stamina’ Well, yes. Not even a cider break! These old boys eh? This reminded me of the ‘erefordshire Morris, in the tradition of Border Morris. The Border in question being the Welsh border, and the dancers are in Herefordshire, Worcestershire and Shropshire and also in Wales, going back to the sixteenth century. 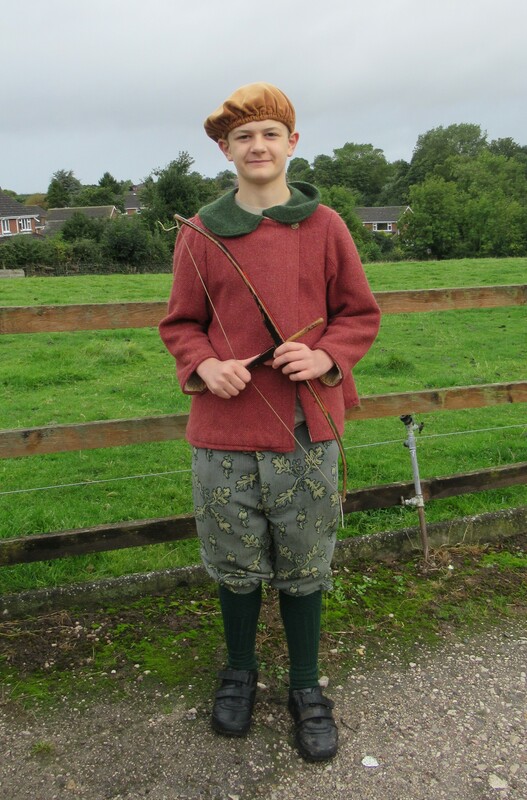 Ever popular on Market Day they also attended wassailing, still going strong along the Marches. Such is the state of British culture now under attack by the forces of multiculturalism, that already the black faces of the traditional Morris have been labeled racist by PC numpties with no knowledge of, nor care for our culture. Shewsbury folk festival has already banned black-face dancers, and so-called liberal ‘activists’ looking for something else to virtue signal against won’t be far behind. Well done for doing such a brilliant and thorough job of chronicling a dying tradition before it’s too late Mary. How many people speak out against the dumbing down of everything into black and white? How many are cowed by the moral blackmail used to reject all dissent from the current homogenising meme as racist? If even a five-centuries-old tradition is attacked, nothing is safe from the politically correct comfortably numb. PETA might object to the abuse of a ‘obby ‘oss after all. Interesting the ages of the dancers way back then, when human lifespan is supposed to have been extended by modern science! Average age of 103 is good going. Must be all the dancing and cider. I think that the ‘modern science’ lifespan extension thing is largely to do with amazing reductions in infant mortality which helps increase overall stats. But yes, over 103 way back when is definitely going it some! Phew, thanks for that info (and the pic via email) – fascinating. A bit of historical insight would help solve many issues that agitate folk unnecessarily. The horns are really heavy and I was really impressed. 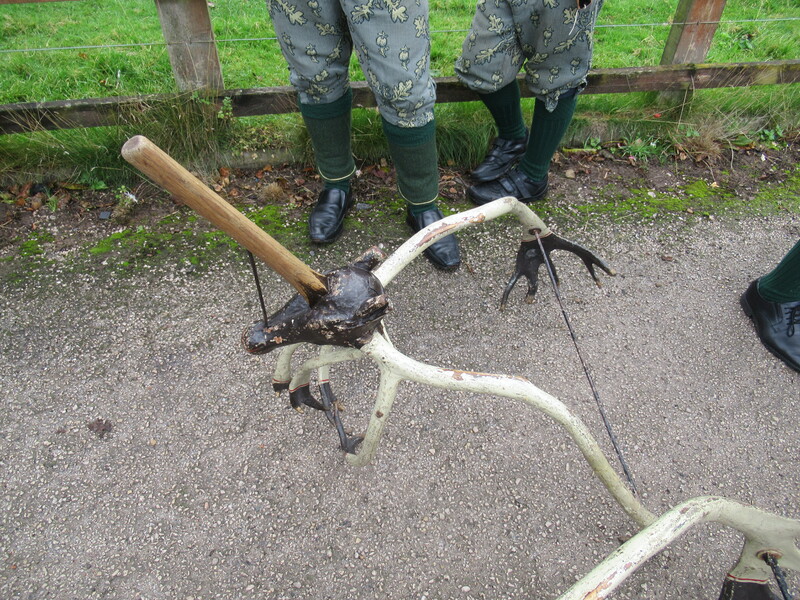 The hobby horse was also very heavy! Stalwarts, one and all.